The Dymo LabelManager PnP is (as it's name suggests) a true Plug-N-Play device. Whether you're a Windows user or a Mac user, you can plug this machine into a USB port and be printing labels within seconds using the 'Dymo Label Light' software that is pre-loaded on the label printer. Note: the 'Light' version differs from the 'full' version of Dymo DLS (software) in that it only supports the device it is loaded on - the full version supports many different Dymo printers and label makers and requires a full install on your PC or Mac. The Light version gives you every bit of functionality you'll need from your LabelManager PnP. - If necessary, press the power button to turn on the label maker. Depending on Windows AutoRun settings, the software may start automatically. (i) If the AutoRun or AutoPlay dialog box appears, follow the on-screen instructions to start the DYMO Label Light software. - If necessary, press the power button to turn on the label maker. 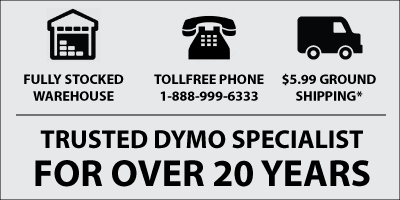 The DYMO PnP volume appears on your desktop. - Double-click DYMO PnP to open the volume. - Double-click to start the software. The Dymo LabelWriter PnP is an affordable label maker that prints on LabelManager PnP D1 labels. D1 labels are very durable and are available in a whole range of sizes and colors.